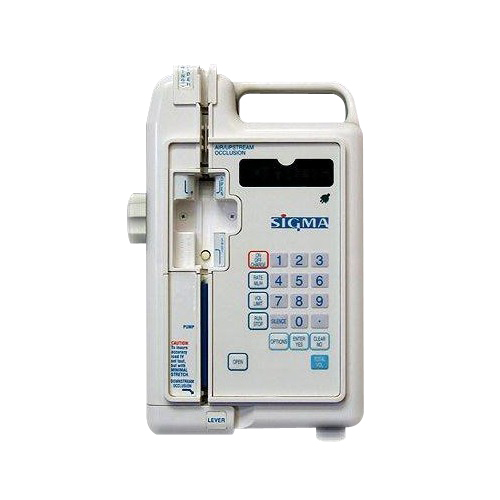 Buy or rent pre-owned, recertified Sigma 8000 Infusion Pumps you need today. All pre-owned medical equipment is patient ready equipment and is covered by an OEM matched warranty. Type: 12-volt battery pack consisting of 6 each 22.2V/2.5 amp rechargeable sealed lead acid batteries Operation: (for batteries in “as new” condition only). >4.5 hrs. to LOW BATTERY indication. >30 min. from LOW BATTERY to PLUG IN alarm. Recharge time: 18 hrs.